← Have You Heard the Sheep? Come check out a Regional Emergency Medical Services Authority – REMSA Ambulance without the need to have a real ride in one – at Kids on Big Rigs. Look for the Humboldt-Toiyabe National Forest staff and Fire Engine at this year’s Kids on Big Rigs. Lazy Sundae Truck, All Wrapped Up Food Truck, Bodawgs, and Hot Dog Rod will be serving up scrumptious foods and desserts this Saturday April 30 at Kids on Big Rigs. The Washoe County Raven Helicopter will be coming to Kids on Big Rigs barring bad weather conditions or any emergency calls. Milne Towing Services to the rescue! They will be sending a tow truck to this year’s Kids on Big Rigs. Be sure to stop by and say “hi” to the tow masters. 3D Concrete is cleaning up one of their concrete mixer trucks for children to look, touch and explore- all up close and hands on – at Kids on Big Rigs. New York Life Insurance Company – Reno will be doing CHILD IDs at Kids on Big Rigs. All children accompanied by a parent or guardian will recieve a free ID card complete with contact information and finger prints. Cub scout troop #43, Boy scout troop #43, and the Boy Scouts of America are always ready for any situation and want to remind you that only CASH is accepted at Kids on Big Rigs. 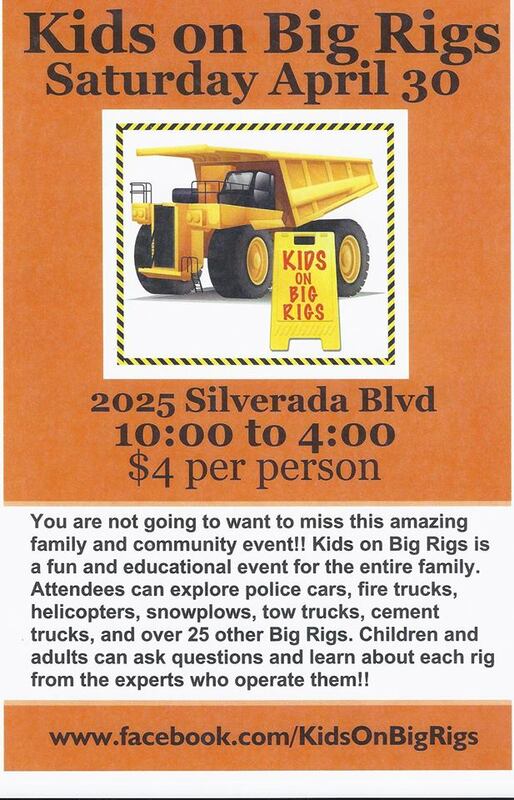 Admission to Kids on Big Rigs is only $4 per person. Other activities and food are additional $. 3. Bring papers to shred at the Iron Mountain shredding truck. This entry was posted in ArrowCreek 411, ArrowCreek411, Humboldt-Toiyabe National Forest and tagged 3D Concrete, All Wrapped Up Food Truck, Bodawgs, Boy Scout Troop #43, Boy Scouts of America, City of Reno, Cub Scout Troop #43, High Desert Montessori, Hot Dog Rod, Humboldt-Toiyabe National Forest, Kids on Big Rigs, Lazy Sundae Truck, Milne Towing Services, New York Life Insurance Company, REMSA. Bookmark the permalink.